This is a beautiful story about a girl named Wangari from the Kikuyu tribe in Kenya. Wangari had the chance to go to school in Kenya, which at that time was not a usual occurrence. She spent her younger years with her mother and gained an appreciation for trees and the special significance they had to her community. Her community believed that their ancestors rested in the trees' shade. As she succeeded in her studies, she always wanted to remember her Kikuyu tradition of respecting all things. She told her friends the goal she had to be a scientist and they replied that not many Kikuyu women became scientists. Wangari was determined, and believed a woman could do anything even if it hadn't been done yet. She attended college in America, but after graduation decided to return home to help her people, especially Kenyan women. She was one of the very few science professors at the University of Nairobi and worked for equal rights so that female scientists would be treated equally to male scientists. As years passed on, this true story takes a turn when Wangari’s country officials sell the land to wealthy businessmen that cut down the ancestral trees. Most Kikuyuans were going hungry because without all these trees, there was no food. Wangari was inspired to plant more trees, but was criticized that she had too much education. Wangari did not care about her critics and traveled to many places planting more trees. This did not sit well with those businessmen, and Wangari was arrested. While in jail, she used this time to tell the female prisoners her story. When released from prison, Wangari once again traveled planting seeds for trees and speaking out on behalf of women’s rights. In 2004 Wangari won the Nobel Peace Prize. It had never been awarded to an African woman. 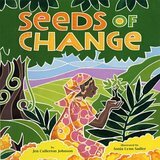 This book is a great opportunity to inspire students to become advocates for women’s rights, cultural awareness and environmental awareness. As a young girl growing up in Kenya, it was unusual for girls to go to school, and especially to go to college. There are many places in the world where girls do not have an opportunity to go to school. Not only is this a great issue addressed in the book, but it also shows the importance of raising awareness of nature and culture surrounding, the particular trees that were special to Wangari’s people. I think a great activity for children after reading this book would be to plant a seed of their choice, preferably something that grows quickly and easily and blooms within the season. An example of easy seed to plant in the classroom would be bean seeds but it would be the student's decision. The student would make observations and record them in a notebook. The goal would be the students coming to an understanding that actions over time can spur on change. Their action of watering the plant and caring for the plant, although imperceptible on a daily basis, but on a longer timeline, the benefits can be noteworthy and visible as the plant grows and blooms. It they did nothing to the plant, nothing would happen. It is sometimes not enough to know what to do. It is more important to actually do it.